« How to Go Veg without Going Crazy: Article 4. Why Going Meat and Dairy Free is Better for Us. Let’s agree: pancakes are the ultimate breakfast comfort food. Not many other breakfast dishes can compare with pancakes in versatility: they can be big, they can be small, they can be topped with maple syrup or honey or bananas or chocolate syrup, they can have chunks of fruit or chocolate/butterscotch/peanut butter chips baked into them – and that’s even before we dig into all the varieties of pancake batter! For a lot of us, homemade pancakes have always been made from some kind of boxed pancake mix with eggs+butter+milk, etc. – unless you felt adventurous on a Saturday morning and decided to experiment with making them from scratch. I’ve always preferred to make everything from scratch, but honestly, pancakes were never on the list of things that I routinely made for breakfast. However, Rob had always loved them (and waffles) as a weekend breakfast option, so every now and then he would make them himself (to this day, I don’t really know how to operate our waffle iron because it’s ‘his’ appliance!). Interestingly, things changed once I became vegan. I wanted to make sure that we could still enjoy our favorite dishes (vegan versions of them), so pancakes were one of the first dishes I made to show to Rob that vegan didn’t necessarily mean ‘deprived of all things loved before’. 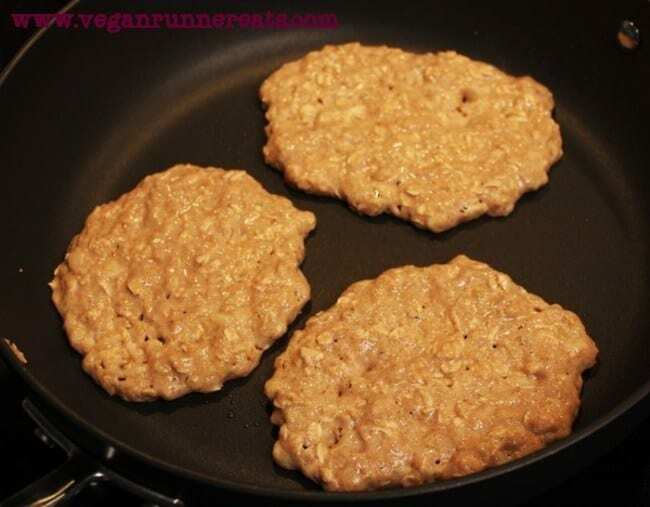 And how surprised I was to find out that there are countless versions of vegan pancakes that come out fluffy and delicious without any of the heavy ingredients of regular pancakes! I’m aware of the existence of vegan pancake mixes, but in my opinion, making things from scratch is always so much more rewarding, and it doesn’t necessarily take more time! Plus, even vegan mixes can have processed ingredients and weird chemicals added “to preserve shelf life” etc. When I make the pancake batter myself, I always have the benefit of knowing what went into it – that alone gives me peace of mind! 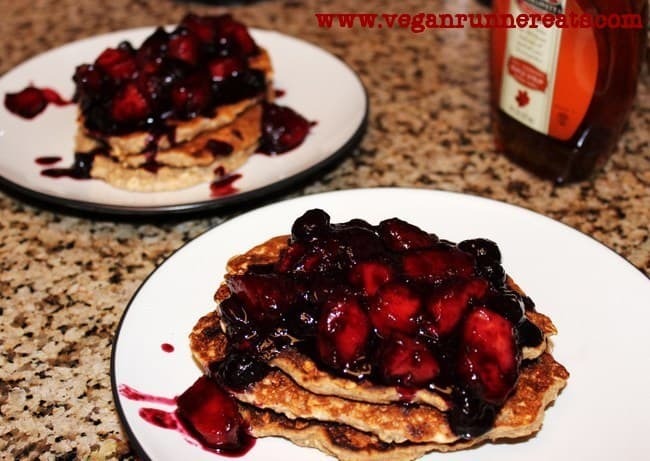 Out of all kinds of vegan pancakes I’ve made so far these are Rob’s favorite! He loves bananas, I love oatmeal – these guys have them both! Because the recipe calls for rolled oats, these pancakes come out nice and dense, but not shoe leather-tough. I don’t like my pancakes too sweet, especially if I plan on topping them with syrup or any kind of additional sweet toppings. After all, there’s plenty of sugar in bananas, so feel free to omit agave nectar when making the batter. For these guys, I made this lovely blueberry-peach compote – because if we can sneak in some fruit, we should always go for it! Living in Alabama comes with a benefit of having all-you-can-eat peaches throughout the summer – and blueberries are always a store trip away. This blueberry-peach topping is surprisingly quick and easy to make! I can see all kinds of other recipes for which I can can use it – coconut ice cream, cheesecake, you name it! Feel free to double or triple this recipe if you have a crowd to feed! The leftover pancakes can always be frozen and reheated in the toaster for a quick midweek breakfast fix. These pancakes are guaranteed to warm your heart and stomach every time you make them! The combination of bananas and old-fashioned oats in the batter yields a nice flavor and texture, and topping them with the Blueberry-Peach Compote brings the taste to the next level. Feel free to double the pancake recipe and freeze the leftovers for a quick mid-week breakfast. In a small cup, mix ground flax seed with water. Stir well, set aside for 5 min. In a medium bowl, mash bananas with the following 5 ingredients (through almond milk) until the mixture looks homogeneous. In a small bowl, add flour, oats, salt, and cinnamon. Stir until well mixed. Add dry ingredients to wet ingredients along with flax mixture, stir until just combined. Heat up a skillet on medium-high. Spray with olive oil spray (or omit if using a good non-stick pan). Working in batches, add pancake batter to the pan in 1/4-1/3 cup portions, spreading slightly. Reduce heat to medium-low and bake pancakes for about 4-5 min per side, or until well cooked through. I use 2 pans at the same time to speed up the process, fitting 3 pancakes per pan at a time. Serve immediately topped with Blueberry-Peach Compote or your favorite topping. Heat a small pan on the stovetop. When the pan is hot, add frozen blueberries and 1-2 Tbsp of water. Reduce the heat to medium and cook for about 3 min, stirring often, until blueberries look partially broken down. Stir in brown sugar, cook for 1 min stirring constantly. Add peach slices, stir. If using fresh peaches, take off the heat right away. If using frozen peaches, let cook for another 1-2 min, and then take off the heat. Stir in lime juice, using more or less to taste. Use as a topping for pancakes, ice cream, cheesecake, etc. Do you have a favorite pancake recipe? 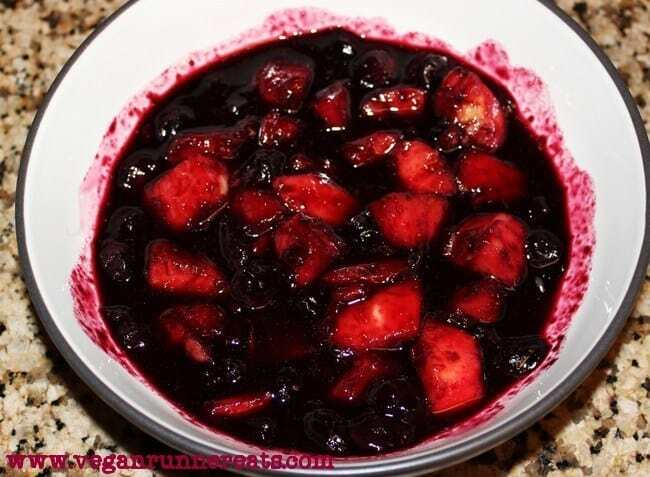 Or a favorite topping/compote? Please share with us! 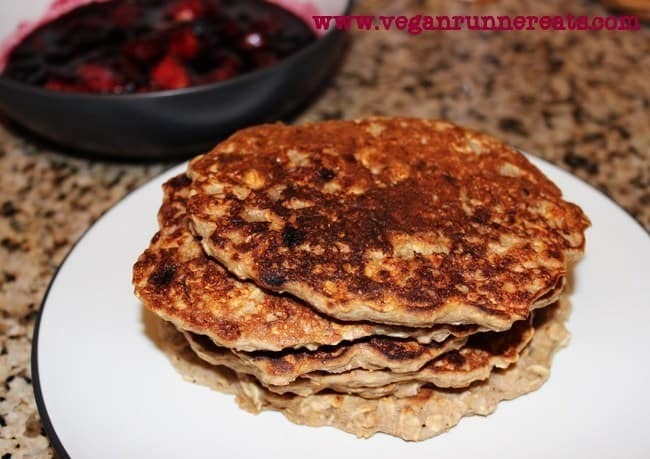 Tagged blueberries, cinnamon, ground flax, pancakes, vegan breakfast, whole food plant based diet, whole grains. Bookmark the permalink. Very good! Hearty and filling but not too heavy. Glad you liked them Gary!